HANNUKAH: Can Israel Survive Trump? Non Jews may not understand that Hanukkah, this eight day holiday, is more like the fourth of July or cinquo de Mayo then it is like Christmas. 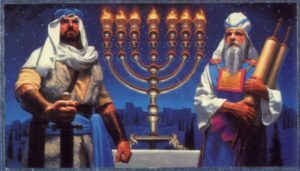 The heroes of Hanukkah, the Maccabees, were the band of brothers, sons of Mattathias, who over through the Greek occupation in 168–164 BCE. Sadly, the effort to re establish a Jewish state failed. The decedents of the Maccabees, the “Hasmoneans,” became the corrupted priest hood described in the Christian bible. The Hasmonean priests were appointed first by the Greeks and then by the Romans, Efforts at passive resistance led by the Pharisees eventually broke down and Rome leveled the Temple in 70 AD. Israel, under Netanyahu and Trump, has enthusiastically entered an alliance with the worst thugs of the Muslim world .. the Saudis and Sisi. As a result Israel’s survival may be dependent on Trump’s incompetence. From its beginnings in 1948 the Israeli state was built on the belief that the part of Palestine west of the Jordan would be partitioned .. creating the Jewish State and along side that an Arab state. The Arab states unified to destroy that idea, instead invading to wipe Israel out. Failing to achieve their goal, the Arab states occupied the west bank and Gaza, creating internment camps for the indigenous Arabs who later came to call themselves Palestinians. Those camps became the poisonous nests that have led to seven decades of endless wars between the Israelis and the the people who now call themselves Palestinians. 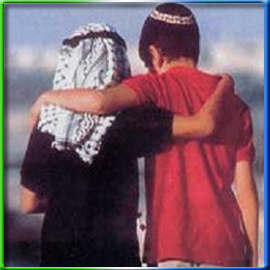 My side, Jews who see ourselves as brothers and sisters of the Arabs want to live in peace, We badly want a two state solution. I suspect Israel’s own 20% Arab minority, also want to see two states. Horribly, the irredentists of the Palestinian side, driven by those seven decades of hate, have sadly never been able to approach the Jews with a believable offer and rejected Israel’s own offers of of two, peaceful states. Over these same seven decades the ugly side of Judaism — the religious right of the Israelis, has grown as well. Unlike the secular founders of Israel, these kippa wearing men carry an an image that makes it hard to imagine two states living in peace. They are the settler who now expand Israel’s intrusion into the west bank. The settlers are not the onky issue. Since 48, Israel has done many ugly things to just survive, including collusion with the apartheid regime to build a nuclear bomb and support for the Trumpist takeover of America’s congress by fundamentalist evangelicals. It is hard to convince good friends among the goyem that we, the Jews, are worth the costs of Israel’s existence. Trump, has enthusiastically entered an alliance with the Saudis. As wealthy Saudi royals fly over Yemen, American bombs poison any chance that Israel can seek peace. The horrific image of Trump dancing the sword dance in Riyahd places him among the thugs of the Muslim world. Israel’s survival may be dependent on Trump’s incompetence. ← Does Israel Need the US When it Has God?